A Friend and I had tea at one of Eastbourne’s seaside hotels this weekend. We hadn’t seen one another in many months and I had missed seeing her. We had lots to catch up on. Unfortunately, many of the local seafront hostelries are of the ‘Fawlty Towers’ variety. But the one we chose was actually quite nice. The sea-front room we sat in wasn’t busy. I wouldn’t expect it to be during off-season. There were no more than 14 guests in the entire dining room. In one corner stood what appeared to be the matriarch of service staff. She looked to be in her sixties and the lines on her face certainly had stories to tell – the most revealing one was that she did not want to be there! I watched her amble up to her customers, shoulders slumped forward, as if in submission to whatever demon it was that haunted her. And with no movement of her elbows, she’d shove a menu card onto the table and walk away. It was an amazing sight. To our fortune we had the other waitress. She couldn’t have been any older than 17. There was a sparkle of youth in her eyes and she was actually a bit ‘over-chatty.' As she moved back and forth from the diners to her prep table, she’d glance back several times, as if she were repeatedly taking a mental inventory of the number of people at the table. There they were, the yin and yang of wait staff. And the scene was not unlike many we witness in Britain’s service industry. Bearing in mind that in Britain salaries for wait staff are deplorable; customers don’t generally tip, and we don’t tend to rate very high on motivating staff. This symbol of age diversity appeared to have just been left to it - to get on with what they were hired to do: distribute teas and cakes and collect the money. Our waitress’ name was Fiona. I only know this because I asked. She had no nametag. But I always prefer to address staff by a name rather than the anonymous ‘Oh miss!’ You would have thought Fiona was from America. It was less than five minutes before we had a complete dossier on her life, right down to the number of days she had been ‘going with’ her new boyfriend, Bryon. (14 days). What I found unique was in how Fiona would methodically work through her tasks. When we ordered, she’d repeat it, not write it down. And you could see her point her eyes upwardly, as if she were gazing into her forehead, to ensure that her brain was connected and paying attention. And after she brought our simple order of tea and scones, she quietly but audibly called out the items that were on the table. ‘Spoons, cups, tea, clotted cream, jam, extra hot water.’ ‘No, there wasn’t any extra hot water.’ Fiona said this, not me. And off she went to fetch more water for the teapot. When Fiona returned with the water I asked her if I could ask her a question. ‘Sure,’ she replied. I told her that I didn’t recall seeing anyone go through such strides before to make sure everything was in place. The list consisted of roughly written, and badly misspelled words; but the point was clear: Smile, say Hi, ask if they like it, get the order right, ask if you can bring more things. There were other words on the list, but I couldn’t quite make them out. Her eyes were wide as if she desperately needed someone to validate her creativity. ‘Well done!’ I told her. ‘Who taught you to do this?’ I asked. ‘Nobody, I just want to make sure I do things right,’ she said confidently. I told her I thought she was doing a lovely job and she should be proud of how hard she was working. Fiona left the table smiling. She came around twice and asked if there were anything else we would like. Rather than focusing on our originally intended chit-chat, my friend and I continued to watch her. She had regimented herself in the way she served her guests. And my friend noted that it was almost as if Fiona intentionally distanced herself, as far as possible, away from her grandmother. We didn’t need to ask for the bill. Fiona watched to see when we had finished. She came up and asked if there were anything else she could bring us. And when I said ‘no, thank you,’ Fiona asked if she could leave the bill on our table and she would come collect it whenever it was convenient for us. I smiled at her. Her demeanour was lovely and I have no doubt, with the determination she showed us, she will rise above the obviously difficult life she has already endured. But I had a surprise to come. Fiona looked at us and asked, ‘do you mind if I ask you two something?’ I said ‘sure,’ not knowing exactly what was coming. ‘ It’s kind of personal,’ she added. In that instant I had a sudden surge of adrenaline, as I was preparing myself to be asked if we could either adopt her, or fund some home-study course on hotel management. Shame on me. We all encounter moments in our lives that we instinctively know we will never forget for as long as we live. I had to stand up. I smiled at Fiona as I rose from my chair and I placed my hand on her arm and looked intently into her eyes. I think she wanted to hug me. It was quite cute watching her body language as she smiled at me, then looked at my friend, then back at me. She didn’t, but I know she clearly understood what I had shared with her. There are lots of Fiona’s in this world. And there’s an equal number of Gloom Monsters about as well. But it’s the Fiona’s who will prevail. So, whatever it is you are striving for; be it a medical degree, a relationship, or the field of hospitality, it is today that you are the best. Now, leave everyone behind in a trail of smoke! May God bless you Fiona, wherever life takes you. 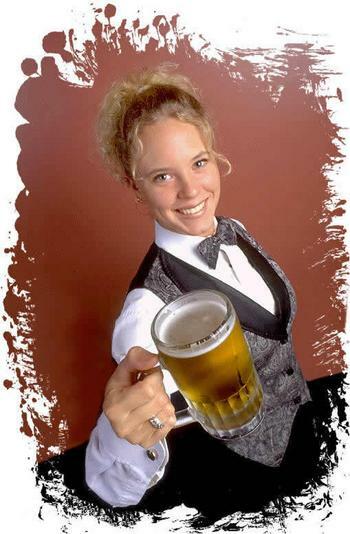 Labels: Best Waitress in the world, Hospitality Training, How to be the best waiter, How to be the best waitress, Restaurant Training, What makes the best waiter?, What makes the best waitress?